Pattern Clarification When you finish the ribbing, switch to the larger circular needle to knit the body of the hat and switch to DPNs when needed during decreasing. pattern that had all of the kids sizes and then another for the adults and so forth. The thing is, I could never seem to find one that just had all of them—not even through copious amounts of searching on Ravelry. It just didn’t exist. So, when I started designing for Jimmy Beans about six months ago, I told Jimmy, “I know it’s a super basic idea but, I really want to write a pattern that includes hat sizes for the whole family!” She said, “Great! Can you make it for both knitting and crocheting? !” So of course I said yes and immediately picked out some gorgeous Swans Island Worsted yarn in both the Natural Colors (dyed with natural plant based dyes) and the Pure Blends (undyed)! Using a high quality, 100% wool yarn (non-superwash) is ideal for hats because it regulates temperature and wicks moisture the best of any fiber making it perfect for use all winter long. 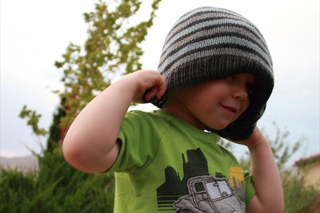 Plus, with amazing yarn and an adorable 3 year old as your muse, how can you go wrong?!?! 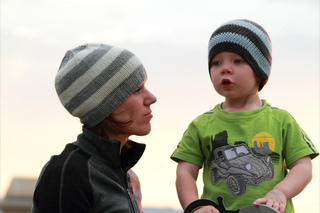 What is great about this pattern is not only do you have all of the sizes you need for just about everyone in the family, you also have instructions for customizing each hat. 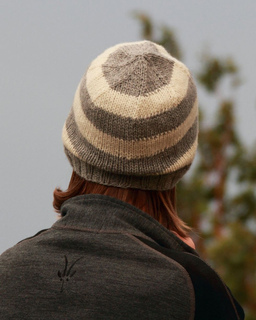 The pattern I’ve created includes tips on making your hat slouchy, doing different stitch patterns, adding stripes, etc. It’s all information that took years of trial and error to learn and hopefully will help you sucessfully make numerous hats. Think of it as a recipe- you might follow it for the most part, but substitute some of the ingredients for things you like better like 1x1 instead of 2x2 rib, etc. The best part is all you need is this one pattern and you can knit one for everyone on your holiday gift list or to support your favorite sports team! (Cascade 220 is awesome for this.) I hope you have fun creating these custom hats for all of your loved ones! Thank you to Swans Island for providing the yarn for this project!